Grace Church, Honesdale is a parish in the Diocese of Bethlehem, PA of the Episcopal Church, USA, chartered in 1832 by the Commonwealth of Pennsylvania, the Church is built on land deeded by The Delaware & Hudson Company, under Philip Hone, himself. As our Home-Page states, Grace Church is traditionally progressive or progressively traditional parish. Take that however you wish to interpret it. As all Episcopal Churches, we are both Catholic and Protestant, Evangelical and Sacramental, Ancient and Modern, Informal and Solemn, Saints and Sinners. We seek to be open to the community as a welcome spot for private devotions (the Church is open from 7:00 AM until 9:00 PM), public meetings of various and even opposing groups in the community, a shelter in time of need, and a perfect venue for artistic and musical expressions. Grace Church is blessed with a beautiful facility with inspired and inspiring architecture, stained glass and wood carvings, musical instruments – and above all, our dedicated people. We have a rich heritage and a promising future. And we invite you to be a part of our celebration of God’s love. has been our priest since January 2008, after serving 10 years at St. John’s Church in nearby Hamlin. Fr. Erb began adult life as a Church Musician, having served several parishes in Central PA before following the call he felt in college to the ordained ministry. At college, he majored in Biblical Archeology, Religion and Music, and felt that God was calling him to use his musical talents in the Church. 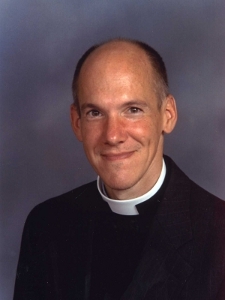 15 years later, the nudge came again, and with the encouragement of his wife Susan, now of 35 years, he entered the process and was ordained by Bishop Michael Creighton as a priest in his home parish of Christ Church, Williamsport, where he learned what it was to be a Spirit-filled Anglo-Catholic. That said, Fr. Erb claims to be a “Rite 3-1/2 Anglo-Catholic” fully appreciating and loving the tradition of the Church, and wanting to bring it forward for the faithful of the 21st century – a hard task, to be sure. And yet a rewarding challenge. Often prayers from differing traditions make their way into our services. While occasionally incense and genuflexions make a presence – who could celebrate the feast of Epiphany for example (“gold, frankincense and myrrh”) without burning incense? Much of it is wishing to engage the children. How they respond to ceremony mixed with joyous fun and education within the liturgy is amazing! Fr. Erb, in addition to his responsibilities at the parish, works as a chaplain to Wayne Memorial Hospital and Hospice service. He is also deeply committed to work with the local Cub and Boy Scouts. He continues active in the musical field as an organ recitalist and accompanist to local soloists. He is a member of the Royal School of Church Music, having served on staff as Organ Scholar Mentor for the Kings College/Wilkes Barre course for several years. You can also see Fr. Erb on his 40-year old 10-speed bicycle (in 2011, he led a group of Boy Scouts on a “century” ride – 100 miles in a day in honor of the Troop’s 100th anniversary) or on his skis (also leading Scouts to an annual trip to New England). Wife, Susan, just shakes her head. Fr. Erb also has served on the Diocesan Commission on Ministry for 12 years, a member of the Diocesan Liturgy & Music Commission (having co-chaired for many years as “Canon Ed”), and also as interim Missioner for Youth in the Diocese. He serves as Diocesan trainer of Lay Eucharist Ministers and Lay Worship Leaders, and as a mentor for Deacon interns. He is also an Associate of Holy Cross Monastery in West Park, NY, and is deeply committed to the Benedictine model of the ministry hospitality. 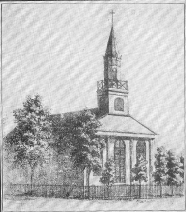 Grace Church was organized in February 1832 by a group of earnest young pioneers in the new town of Honesdale who desired an Episcopal form of worship so they gathered at the Wayne Hotel to draw up a charter of organization, choose a Vestry, planned a church building and hired a rector. The parish was originally to be called St. James Church, but as the group was organizing, a similar group of interested churchmen was being gathered in Bethany, then the county seat, the Honesdale parish was invited to join with them in organizing Dyberry Parish, with two churches – Truth Church in Bethany and Grace Church in Honesdale. The fellowship in Bethany never materialized, and with Honesdale the new county seat (as the town grew under the Hudson & Delaware Co.) Grace Church remained. The founding of the parish was accomplished through the generosity of D&H who donated land for the Church and Rectory and friends from New York and Philadelphia, particularly Mr. Philip Hone, Mayor of New York and President of the D&H Canal Company. $725 was subscribed and the Church began its ministry. The first wooden structure was built in 1833 on the present site, the southern corner of Central Park. In 1854, a larger building was felt necessary, and the present stone structure was erected. Its beautiful Gothic lines and windows reflect the Oxford Movement prevalent at the time and thanks are due to the New York architects Willis & Dudley . The adjoining rectory was built in 1875 and the graceful spire was added in 1878, the gifts of the Russell family. The original wooden structure was sold to the German Catholic congregation, moved and subsequently succumbed to fire. The stone structure itself suffered from a fire in 1883 and flooding in 1902 and ’42. It’s decoration was completely restored in 1991 by the Byron S. and Hortense Miller Trust. In 1949, the parish received a magnificent gift when a modern parish house was added again thanks to the generosity of Mr. & Mrs. Miller. It contains an auditorium and stage, a large equipped kitchen, sacristy, secretary’s office and rector’s study on the first floor; Guild rooms, the St. George meeting room (housing the Wayne County Habitat for Humanity office), the Library, Church School classrooms Children’s Chapel, a Choir Room on the 2nd floor and a Sexton’s apartment on the 3rd. The Church building features several Tiffany windows, fine wood carvings, and original paintings behind the Altar and adorning the stage and window casings in the Auditorium (featuring scenes of the history of Honesdale) and the finest pipe organ in the area as well as a fine 1902 Steinway piano, resounding in excellent acoustics. We are a venue for many community concerts and artistic presentations. Grace Church is proud to provide the home for the 12-Step programs in our borough. The Church co-hosts with First Presbyterian Church weekly Community Dinners held each Saturday. Cub Scout Pack 105 is chartered through Grace Church. We provide office space for Habitat for Humanity and house the Stourbridge Model Train Club. Numerous community groups utilize our facilities for concerts, classes, programs and meetings. 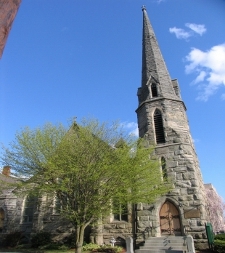 Grace Church is a parish of the Diocese of Bethlehem (PA) in the Episcopal Church, USA. Taking the tradition into the future.